A scientifically advanced SUPER-MUD clearing treatment to target, prevent, and heal problem skin. 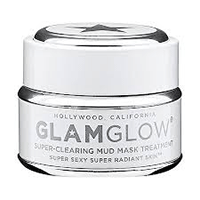 This formula was clinically developed by GLAMGLOW dermatological chemists to help fight all common skin concerns including breakouts, discoloration, black and white heads, razor bumps, and in-grown hair. Powerful, skin-clearing mud visibly draws out dirt and congestion while a proprietary six-acid blend dramatically brightens and softens skin. It works to magnetically draw out dirt and pores with Activated-X Charcoal, leaving skin smooth and healthy-looking.